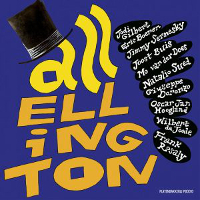 The intergenerational Amsterdam collective All Ellington, started by Eric Boeren, has been playing music by Duke, Strayhorn and company since 2013. Its ranks also include A’dam improvising linchpins Joost Buis, Wilbert de Joode and Oscar Jan Hoogland, so you might reasonably infer they play the compositions with respect and also slide out of the frame into freer space, sometimes improvising transitions between pieces. Misha Mengelberg’s/ICP’s engagement with the Ellington repertoire 30 years ago set that template. But after five years of breaking down the original charts by ear, and honing them in intensive rehearsals (Boeren: “We have several band members with a terrific ear for harmony”) and despite some personnel changes, All Ellington also do something trickier. As their eponymous CD demonstrates, they frequently animate the elusive Ellington effect itself, the sound of Duke’s actual scoring, working with only three reeds and three brass. Not just the totemic pixie-mutes-under-plungers wah-wah stuff, but the sublime Strayhorn reed voicings. Putting all of that together, they make this music their own. Cornetist Boeren, and the other principal arranger, trombonist Buis, first played obscure Ellington in the early 1990s, before they ran their respective Ornette and Sun Ra repertory projects, bands that slid into and out of the sounds of their role models the way All Ellington does, and which had Wilbert de Joode on bass. The under-performed Ellington here come from various suites, Perfume to Far East, and from Barney Bigard and Cootie Williams small groups. There are also some evergreens. To achieve that Ellington effect, it helps that altoist Mo van der Does (20 when the band recorded) and baritone saxist Giuseppe Doronzo can slide into Johnny Hodges inflections and Harry Carney vibrato at will, but use those powers sparingly. Tenor Natalio Sued, given the Paul Gonsalves slot on “Mount Harissa” only meets Paul halfway, retaining his own Argentine romantic (and Warne Marsh–loving) side. (The saxophonists double on clarinets/bass clarinet.) In a similar way, Buis may reference Juan Tizol or the Joe Nanton ya-ya lineage (notably on “Sonnet for “Sister Kate,” Boeren’s chart with organ chords from background horns). The effect also relies on idiosyncratic blending of the horns – AE’s pocket-sized sections are tight – and that deft arranging: ex-bandmember Michael Moore’s setting of “Mount Harissa” with its five-voice backgrounds for Sued’s steaming catch the flavor of the original, or Buis’s “Zweet Zurzday,” refining the 2003 version by his Astronotes. The brass trio reunites Boeren and trumpeter Jimmy Sernesky, for the first time since Available Jelly’s gem Monuments (Ramboy) 25 years earlier. Sernesky is a terrific, too little known sweet/tart lyrical player who gets good exposure here, notably on the opener “Night Song,” a jaunty Tizol–Jimmy Mundy ballad Cootie recorded in 1937. AE’s version starts with a stark repeating saxophone bell/block chord like an oncoming night train – and which carries on, persistently, till the reeds slide into silky Duke mode midway through. Boeren opens up “Black and Tan Fantasy” to give Sernesky more room to strut, and does a little plunger Bubbering of his own. Eric also steps up on the collectives, where, per Dutch practice, dynamics and density are conscientiously varied, and relations are in flux. On three pieces singer Jodi Gilbert joins the nonet. She is typically heard in abstract and sometimes broadly expressive settings – try Spoon 3’s Seductive Sabotage (Evil Rabbit) – and mixes it up with the horns, in particular on Boeren’s broadly growly “Strange Feeling.” (But then here come those saxophones again.) She sings “Sophisticated Lady” and “Solitude” disarmingly straight, with sweetness (early on at least), the way Duke preferred ballads sung. She lays out the word “sol-i-tude” with even note values on the first two syllables, just as Ellington wrote it, where other singers tend to shorten that short i, swinging the word like a triplet. That small choice speaks to how closely they all mind the original texts, before heading for the hills. Wilbert de Joode’s plump bass attack is as valuable here as everywhere else, and period appropriate. He’s their Blanton, and it’s good to hear him romp through changes. He gets the melody statement on “Sonnet in Search of a Moor,” under clarinet pastels, and nudges the bow along on the intro to “Sophisticated Lady,” arranged by Doronzo who channels Carney aping Hodges. Ex-Los Angeles, ex-Chicago drummer Frank Rosaly applies his Billy Higgins training. Sometimes understatement is more effective, not least where so much is happening already. Rosaly doesn’t play like this is a big band. He keeps things swinging with a light touch. It’s a tall order, being the pianist in an Ellington tribute band. Oscar Jan Hoogland handles it very deftly, evoking Duke’s decorations on “Sophisticated Lady” and getting at the jabbing drive on “Mount Harissa” without neglecting his own investigations of piano timbre: his strummed autoharping under the hood on “Zweet Zurzday,” say. Hoogland just hints at a reggae lope on “Sonnet in Search of a Moor” – more than a whisper would be too much. (Precedent: the Mercer Ellington ghost band’s ghastly “Queenie Pie Reggae.”) On “Harissa,” or “Black and Tan,” Hoogland blows up the Ellington percussive gestures beyond life size. The pianist does much to set the tone, in an unobvious way, exemplifying the band’s approach: Duke’s music is too pretty not to play straight, but we also do this other weird stuff (that we can also trace back to him). They know that if you’re going to play the genius music, you can’t dumb it down. When it comes to improvisation there’s something to be said for both familiar partners and a certain unfamiliarity. This trio has it both ways. 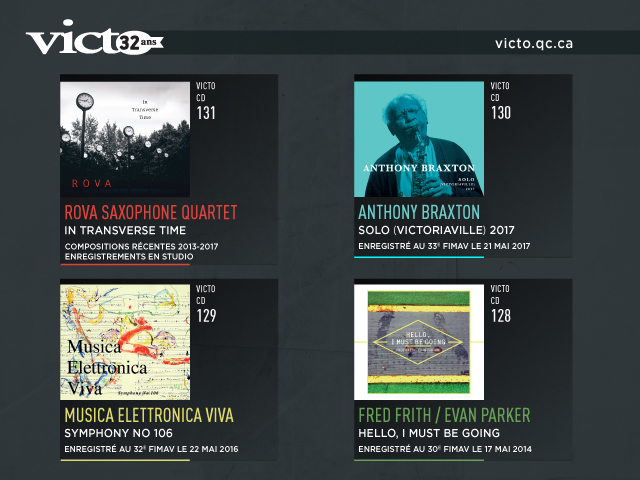 When it was recorded in 2014, Anthony Braxton and Taylor Ho Bynum’s first recorded meeting was fifteen years old. Since then, Bynum must have spent more time working with Braxton (and in more contexts – from duo to associate conductor in multiple orchestra pieces) than any other musician. Meanwhile, pianist Bob Bresnan has a single Discogs credit, as one of the executive producers on Braxton’s opera Trillium J. Further, improvisation (and that of the free sort) means many things to many people, from the rapid-fire, torrential rush of energy music to the random placement of isolated events in space. 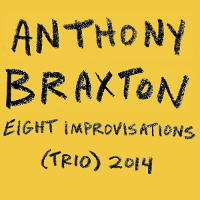 There’s evident room for all of that within the malleable structures of Braxton’s (and Bynum’s) compositions. In the eight improvisations you get here, however, I suspect the working definition might not be too far from what Lennie Tristano and associates imagined (if didn’t realize) when they recorded “Intuition” in 1949. There’s the fluidly continuous invention without the lingering shadow of repeated harmonic patterns. The instrumentation even suggests the Jimmy Giuffre trio of 1958 with Bob Brookmeyer on valve trombone, especially when Bynum plays bass trumpet, and few sounds ever fall into the even moderately harsh or weird zone. Instead there’s an emphasis on continuous linear dialogue, the trio’s lines dovetailing and complementing one another, with plenty of duets but rarely solos. With Braxton shifting between sopranino, soprano, alto, and baritone saxophones and Bynum between cornet, flugelhorn and that bass trumpet, there are constant shifts in range, and a certain blurring of identity. The lines of Braxton and Bynum are so mildly distinguished at times, that a muted cornet and a soprano saxophone almost fuse in the early stages of “Four” (the eight improvisations are numbered in sequence, just not presented that way). Bresnan has the developed fluidity to find his way into the developed partnership, definite when called for or evanescent by turn. The result is a kind of improvisatory ideal, its emotional range largely circumscribed by the joy and contemplation attendant advanced interaction, almost as if Teddy Charles and John LaPorta had developed similar musical paths for 60 years without the likely decline, though the identities of Braxton, Bynum and, I assume, Bresnan are intact (I can’t say exactly how he did it, but at one moment Bynum somehow suggests the narrow-range lines of Red Rodney). It’s music for those seeking the simultaneously tight-knit and timeless, a curiously abstract and immediate ideal of jazz beyond the usual notions of sub-genre. Making music for specific sites has been an ongoing practice for John Butcher since he played solo saxophone in World War II bunkers at the Newfoundland Sound Symposium in 1988. Two of Butcher’s recent collaborative recordings update that practice in varying ways. Rhodri Davies formed the group Common Objects in 2005, using a variety of semi-structured pieces, graphic scores, and free improvisation as a basis for their playing. Along the way, the evolving cast of musicians recorded two releases. The first, Live In Morden Tower, captured a performance by a trio with Davies on harp, John Butcher on reeds, and Lee Patterson on “amplified processes and devices” in a 13th century tower located in Newcastle upon Tyne, England. Here, the three mined the resonant acoustics of the ancient turret-room. The second, Whitewashed With Lines, expanded the group to a quartet with the addition of Angharad Davies ‎on violin, as the quartet explored scores based on prehistoric cup and ring marks. Again, the performance settings, particularly the one at The Mining Institute of Newcastle influenced the resulting music. For their third release, Skullmarks, the group has been expanded to a sextet with the addition of violinist Lina Lapelyte, and the electronics of Pat Thomas. 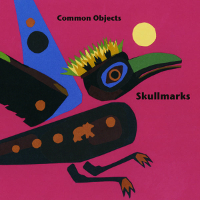 Here, the group responds to an “object score” by John Butcher based on historical objects he selected from the collection of the massive ethnographic Pitt Rivers Museum at the University of Oxford. Choosing two masks from the Pacific Northwest, a bird-shaped water vase from Keres Pueblo in New Mexico, and a painted Bear Skull from Nepal, Butcher thought about the spirit, ritual, and utility of the objects and constructed a piece with the musicians distributed throughout the cavernous space of the museum. The resulting 37-minute long improvisation does an effective job of capturing the distribution of strings, reeds, and electronics in the resonant space, playing off of each other and the natural resonances of the building. The piece begins with each of the musicians building their parts from cycling motifs which accrue into a collective coursing pulse of free beating overtones. Sliding electronic whistles and yowls, and low-end shuddered rumbles enter in to break open the sonic field, creating a particularly effective section with Butcher’s keening soprano playing off of the natural delay of the hall. In his liner notes, Davies references the relationship that musicians have with the “objects” of their instruments and that physicality of the instruments comes through as well. Over the course of the piece, the rise and fall of densities and dynamics creates a captivatingly immersive listening experience. One gets a sense of each of the members of the group responding to their collective memory of the objects Butcher chose, the resulting relationship of the instrumental “objects” they utilize, and the way all of these come together and react in the space of the museum. 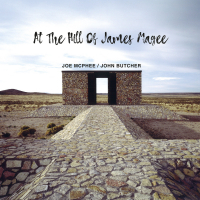 The location of At the Hill of James Magee, Butcher’s duo recording with Joe McPhee, is even more central to the performance. The Hill of James Magee is an installation located in the middle of the Chihuahuan desert in West Texas, 80 miles from El Paso. Surrounded by barbed wire fence, visits are very limited and photos are prohibited. The installation consists of four flat-roofed buildings on platforms connected by walkways, each with towering iron doors in the facing portals. Within each building, there are steel frames with glass enclosures containing strata of organic materials. This site-specific duo recording from April 2010 marked the first of a series presented by The Cornudas Mountain Foundation, which manages the site, and Nameless Sound, an organization dedicated to presenting contemporary music and art education based in Houston. For the opening 21-minute improvisation “Sometimes Yes, Sometimes No” the two reed players began playing solos in two buildings across from each other. The stereo separation places the resonant sound of McPhee’s trenchant alto cries and Butcher’s breathy burrs and percussive flutters hard-panned in separate channels. Over the course of the performance, the two slowly moved from the structure they started in to the one opposite, passing each other on the connecting walkway. While the two-point recording couldn’t possibly capture the actual experience of the audience in attendance, it manages to capture a sense of the event. As the two slowly move toward a free lyricism in their playing as they walk toward each other, the sound of their horns begin to blend in the stereo mix, gradually shifting channels. The improvisation continuously evolves, moving through sections of strident, echoing overtones and muted sonorities. One can sense the way they are each responding to the morphing resonance of their locations in the site and their ability to hear each other, from relative isolation to convergence and back again. For the second half of the performance, the microphones were moved outside of the buildings and the two reed players alternate solos. Here, the resonance and slap-back echoes of the buildings have a more direct presence in the recordings. Both McPhee and Butcher revel in the coloration provided by the site and one can hear them slowly tune and adjust their playing to incorporate the environmental sounds. It is enthralling to hear the way that each player utilizes their distinctive command of their instruments into their solos, with commanding control of the microscopics of attack, decay, breath, and timbre of their respective horns. McPhee tends to fill the space more with his torrents and flurries while Butcher takes a bit more open approach, toying with the natural reverb and delay. The performance ends with a six-minute duo, “St. Ida’s Breath (Less Her Neck and Teeth)” which builds from spare clicks, sputters and pops into a poised dialog of intertwined motivic kernels which the two meld into a sinuous union, ending with the sound of the quiet buffeting of the wind. While the recording does make one wish they were in attendance for this propitious meeting of two masters, it does an admirable job of capturing the event. 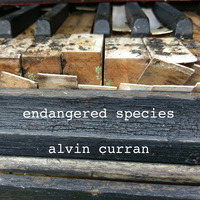 Before becoming a pioneer in electronic music and post-modern composition, Alvin Curran was a teenage pianist, playing jazz in homes and at dance gigs in Providence, Rhode Island. His co-conspirator was a drummer who became the poet Clark Coolidge. In his notes for Endangered Species, Coolidge recalls a revelatory mid-‘50s Dave Brubeck concert at the Rhode Island School of Design; chorus after chorus of Paul Desmond’s long limpid lines and the pianist’s refractive voicings atomizing their budding vantage on improvisation, linked to the time limitations of 10” discs. That inspiration endures on Curran’s 2-disc solo album, on which he revisits standards with the type of facility and imagination too infrequently heard in the distillation of American song. The major twist of Curran’s solos is the interjections of a vast samples library, delivered through the Yahama Disklavier. The collisions between chestnuts like “Bewitched, Bothered and Bewildered” and “As Time Goes By,” and a vast bank of samples spanning a stadium buzzer, chattering chimpanzees, and a Steve Lacy riff, consistently jolts the music beyond the context of attic-rummaging. However, the impact of the samples only rarely obscures the boldness of Curran’s playing. Whether he takes the time to reinforce the roots of a composition, or immediately takes a tangent beyond the melody and changes, there is a compelling dynamic between idiomatic fluency and subversive conceptualism. This is reinforced by the absence of a cliché-ridden meta. Curran does not use the literature simply as an artifact or a punching bag; instead, he digs deep into his own history to tack together a bridge between disparate periods of his musical life. Granted; Curran’s bridge is as creaky as the floor boards he samples, and as twisted as his densest polyphony. But, his playing on Endangered Species is nostalgia-free and his samples – even the Spike Jones snippets – are either too jarring or bizarre to be considered camp. Curran isn’t larking about; he does what Coolidge says that “jazzguys” do – give old songs new life. For some of these moldy oldies, it’s their umpteenth life or even the umpteenth to the tenth power, which makes Curran’s resuscitations all the more engaging. Lisbon-based guitarist Luís Lopes ranges through a bevy of stylistic emphases: the funk-fuelled expressionism of his Humanization Quartet with saxophonist Rodrigo Amado and the crushing rhythm team of the González brothers, drummer Stefan and bassist Aaron; the hard-edged free jazz of the Lisbon Berlin Trio with bassist Robert Landfermann and drummer Christian Lillinger; the abstract, free improvisations of Garden with reed player Bruno Parrinha and cellist Ricardo Jacinto. He has also released two contrasting solo LPs, Noise Guitar, a kind of symphony in feedback, and Love Songs – yearning, meditative and lyrical. These two recent releases present different aspects of Lopes’ musical vision, but each is a remarkable adventure in sustained improvisation. Chalk it up to Lopes’ concern with the particulars of guitar sonority, but his third all-guitar recording is again released on LP. 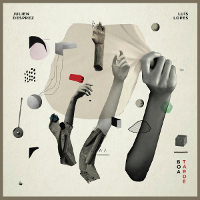 This time it’s a duo with the brilliant young French musician Julien Desprez, who has recorded deeply involving drone improvisations with the trio Tournesol and the extraordinary Acapulco: furiously pointillist, ever-shifting solo guitar created with astonishing simultaneous shifts in both gestural playing (fretting, slashing, shaking, striking) and pedal work. Neither Lopes nor Desprez is a stranger to duo improvisation (Lopes with Noel Akchoté, Jean Luc-Guionnet, and Fred Lonberg-Holm; Desprez with Mette Rasmussen) and that common practice matches brilliantly here with their shared fluency in matters electronic, from the lightest incidental sounds amplified to exotic new identities to subtly detailed, controlled feedback. There is very little “personality play” here. While one can sort out the players and their inspirations, there’s never an easy contrast between, say, Lopes’ post-industrial pastoral and Desprez’s scatter-shot abstract expressionism. Instead it’s two musicians with common technology (and ancestry: Lou Reed’s Metal Machine Music) operating at the highest level of empathy, constructing a sonic world in which feedback becomes architecture – from plumb-lines and foundation to rhombus and trapezoid. In fact, this electronic dream-world sounds as much like circuit diagrams sprung to life as it does like guitars. While the density of sound has a significant substantiality, it artfully evades the visual referent of guitar, achieving a level of musical abstraction that almost defies the volume levels no doubt required to produce it. Lopes is also responsible for what must be the most remarkable collective statement yet to issue from the Lisbon free jazz community, Praise of Our Folly, a four-part 52-minute suite culled (almost magically) by Lopes from four-hours of collective improvisations. LFU, Lisbon Freedom Unit, is a brilliant amalgam of different generations of musicians, complementary conceptions and pre-existent groupings, including Rodrigo Amado from Humanization 4tet, fellow Garden members Bruno Parrinha and Ricardo Jacinto) with the Red Trio of pianist Rodrigo Pinheiro, bassist Hernâni Faustino and drummer Gabriel Ferrandini, whose other allegiances here include membership in Amado’s Motion Trio and the recent duo “Peter Gabriel” with the other tenor saxophonist, Pedro Sousa. The ninth member, turntablist/electronic musician Pedro Lopes, has converted turntables into an advanced electronic percussion instrument. The work begins with Pinheiro’s sharp blow to the piano’s metal frame, a gesture that couldn’t be more singularly dramatic, launching a movement of quietly swarming strings and percussion. The nonet’s reeds don’t come to the fore until the middle of the second movement when they erupt in a brilliant squall with Parrinha’s soprano stretched between the robust chaos of the two tenors. From there, there proceed numerous distinct zones and evolutions in which the densities of detailed burbling electronics contrast with the intensity of the horns, the two combining to create both coherent musical shapes and multiple points of interactivity among the layers. Within the overarching piece, every musician distinguishes himself, but some make special contributions to the whole: Pinheiro’s lively, transparent piano is a key element in creating an orchestral richness, while Pedro Lopes is particularly successful in translating his individualistic materials to the expanded collective idiom. It’s Luis Lopes’ editorial hand, however, that has carved a composition out of inspired material.